Uniform is an important part of belonging to JRCS and we have high expectations of all our students. 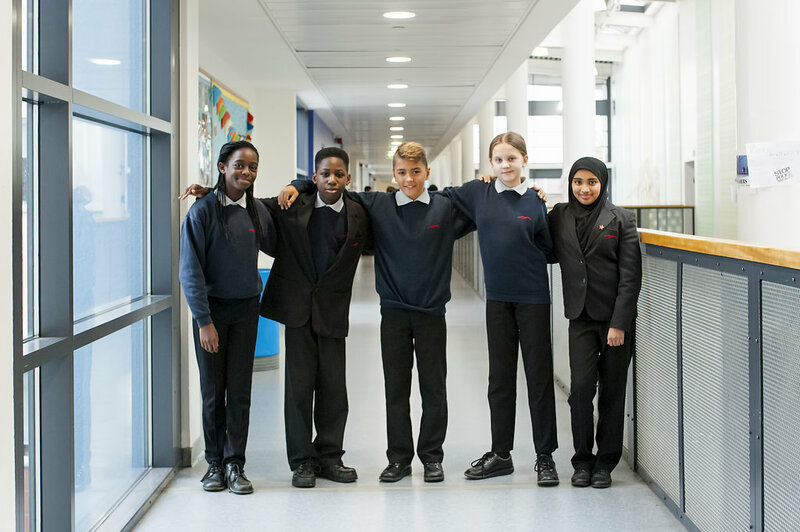 Our uniform promotes a positive image and supports the ethos of the school whilst reflecting the practical needs of the students. Students should remember that correct uniform must be worn to and from school as well as whilst in school. You can purchase School Uniform from the Castle Green Uniform Shop. Click here to access their website. Castle Green uniform shop is open every Saturday 10am-2pm and have extended opening times throughout the Summer period. Please call 020 8724 1500 for more information. In the rare event that a student is unable wear correct uniform, parents/carers must complete the appropriate section of the ‘Permissions’ page at the front of this planner. If this procedure is not followed, then we regret we will confiscate incorrect items, whatever the weather. Confiscated items will be available for collection from the Office by students at the end of the school day. All items of uniform must be clearly marked with students’ names. Plain black tailored school trousers / plain black pleated knee length school skirt. A range of these school skirts is available from the Castle Green uniform shop and we strongly advise that they are purchased from here. Please note that students wearing skirts that are not the appropriate length may be sent home. Jean style trousers and leggings are not allowed. In the summer term, students may wear plain black knee length tailored shorts or shorter trousers (no PE shorts). Plain black smart, low-heeled shoes (or low-heeled boots only if worn with trousers) suitable for school wear with laces or a strap. Trainers, Creative Recreations, Converse, Vans, Uggs, board style, deck style, canvas pumps, shoes with a white/coloured band around the sole or plimsolls are not acceptable and must not to be worn at school or to and from school. Loafers are acceptable. Students may wear any coat, scarf or gloves on the way to and from school. These must not be worn inside the school building. Students who wish to wear a hijab should ensure it is plain black or navy blue. Girls’ headbands must be single width, plain black, navy blue or grey. Belts should be plain black, single width, with no large buckles. Girls’ socks must be plain black and below the knee. Tights must be plain black (not patterned). We expect all students to have an appropriate school bag which will allow for A4 sized books to fit inside without the edges becoming damaged. Students should not use ‘draw-string’ PE bags for their school books and equipment. Sweatshirt, blazer, cardigan or v-necked jumper, all with red JRCS logo (all these items are optional). Black tracksuit bottoms with red JRCS logo or plain black leggings.